I love the bell sleeves and the black belt. 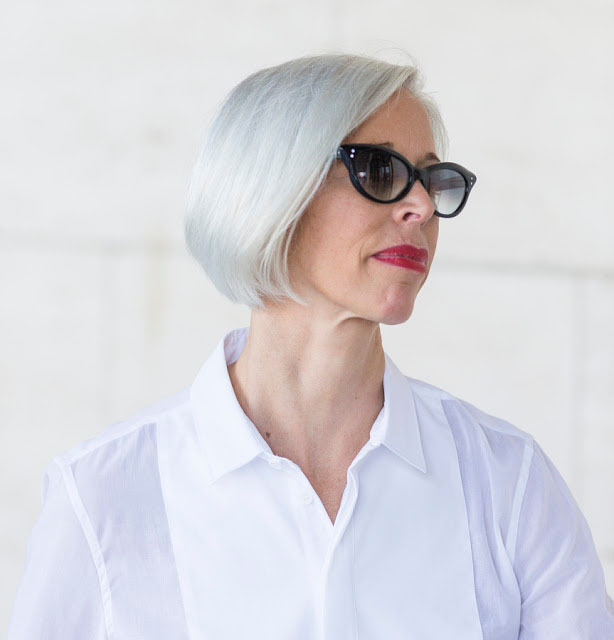 My photographer friend Denton Taylor was able to get pictures of Linda Fargo, Senior Vice President of Bergdorf Goodman, on two different days during New York Fashion Week and it’s interesting to me that Linda wore pure white with no embellishment on both outings. I am sure it was because it was so humid and muggy here, it felt like mid-July! I love it paired with her cat-eye sunglasses, which I think must be the same ones as in this post, a strong red lip, and her perfect silver bob! 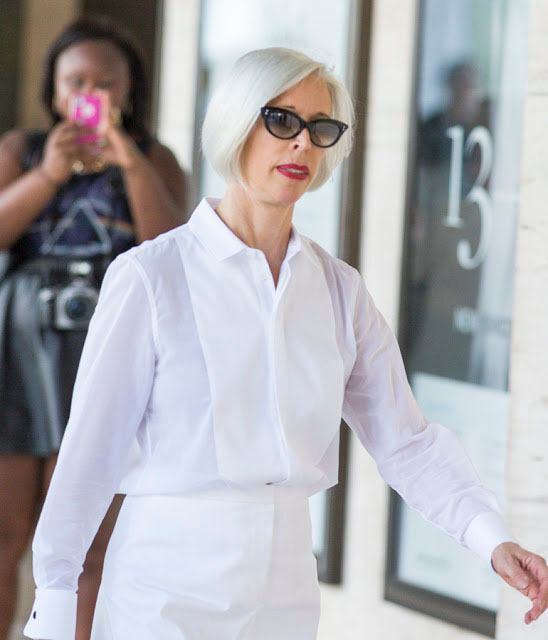 On a different day, a tailored all-white ensemble with cat-eye sunglasses and red lips. Perfection! Oh to have hair like this. I always feel a little skittish wearing white in NYC because it’s so dirty everywhere, but after a few spins around Brooklyn in my white jeans I relax and worry less about messing them up. What do you think of an all-white look? Photos by and courtesy of Denton Taylor. You can see more of his work on his website, or check out his great blog Silver-Haired Beauties. Put Linda at the top of that list! I love the all-white look, but it's not for me. There is a shop here dedicated to all white fashion pieces that's open in the summer only; I always marvel at it when I walk buy. I think the white dresses and knits it sells look great on the hyper-tanned, hyper fit locals. Not on pale, semi-flaccid folk like me! I am with Kelly - all white ok, but only for tanned people in summer. Here it looks like it's used to make a statement. And if I'm honest, I don't like it on the lady either. Only her red lips and the sun glasses add a little life. White is so hard for me--- I am so messy! But, she looks so fresh and crisp and chic!! I feel the red lippy is key. She would be washed out w/o it. It's the critical element of color in just the right place... Her face! Hi Denton, ha, of course you are right, she is being driven around in an air-conditioned car! So maybe she went with white just to be completely different from everyone else? You are the person to tell us, was anyone else dressed in all white or was it just Linda? Hi Jill-You are so right-she is fabulous with that silver, white and red look. Such a strong and stylish silhouette! Glad to hear you are wearing the white in the city-so chic. Hi again Denton, wow that lady is gorgeous! She looks great in her all-white too, with perfectly matching boyfriend at her side! She's always so chic! Love that silver bob. It's stylish and I would love to sport one someday, but you've got to have the right hair and grey...My sister-in-law is from Norway and her mother and many other ladies from Scandinavia have this look. They all look marvelous! As for the white, I love it! I'm terrible though and can hardly get through a day without spilling or sitting on something. Got to have one of those emergency stain pens with you on white jean days!